At a very nascent age of three in 1941 while playing around with her sisters,neighborhood people used to pull her from the play and used to make her sing some songs and enjoy her singing style during those days. S Janaki,the little talented girl regularly enchanted them every time with her cute expressions,which still remain with her. Yes,even today wherever she goes,she will be singing a song in a baby voice at the fond request of the audience. She started singing on the stage also at a very early age with various music troupes and for different occasions. Competitions were never a tense/fear for S Janaki. She won the second prize in the All India Radio National level singing competition,and received the honor from the first president of India Dr. Rajendra Prasad. “Singing is a gods gift to me by birth” – says modestly S Janaki. Her sister’s father-in-law was a mono-actor and S Janaki was a regular performer in his acting shows. Destiny always has its time and no one can avoid whats destined to us. So was S Janaki’s destiny. A new chapter named V Ramprasad (Ramu) began here in S Janaki’s life. Fortunate day! Ramu’s father introduced S Janaki to him and requested to sing a song. There started the bonding between the two hearts and an instant reaction by Ramu to bring S Janaki’s extrordinary talent to limelight. Ramu then requested his father to immediately write a letter to AVM,the esteemed banner for South Indian Cinema. A letter went to AVM with only two lines in it.’ A talented singer is with us,if you are interested please contact us’. AVM responded immediately,recognized the young talent and appointed S Janaki as their Staff Artist on a monthly salary basis. 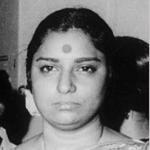 S Janaki entered into the world of music with opportunities pouring in her way and there is no looking back till date. Because of many offers from other film production companies to sing in their films,she had to cancel the agreement with AVM as Staff Artist only after 9 months. Her sister’s father-in-law became her father-in-law too. Ramu tied the knot to S Janaki,blessed with Murali Krishna their only son. 53 years have passed away in this journey of melodious music,and even today this multi-faceted singer has the same spirit at heart,same smile on her face and the same enthusiasm to sing. Though she is the star singer in all four South Indian languages, she is very humble and simple. Simplicity is the only way she has walked through in her life. Career Highlights of S Janaki in Telugu Movies, at a glance covering the most popular songs from five decades of her music career. By the time S Janaki entered film industry, Telugu music industry was enlightened by S Rajeswara Rao, Pendyala, Ghantasala, KV Mahadevan. Among singers Ghantasala, Leela, Jikki, Rao Bala Saraswathy, Jamunarani were at their peak. A.M Rajah had his share of melodies. P Suseela got her recognition and her fruitful journey as leading playback singer of Telugu heroine was all set. 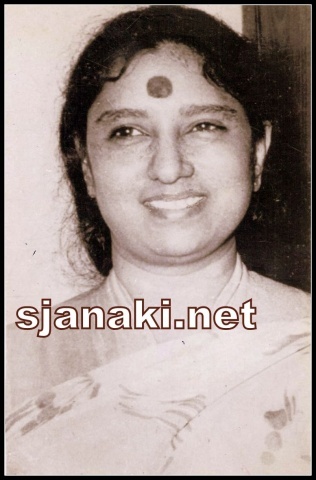 S Janaki sang her first song on April 4th 1957. Very first song with Shri Ghantasala “Nee Aasa Adiyasa” turned to be a big hit, a song that describes the pain and agony in poverty. The same movie MLA had another memorable duet “Idenandi Idenandi Bhagayanagaram” describing the history of Hyderabad city which was also a big hit. She sang some memorable songs in Mundadugu, Daiva Balam, Karthavarayani katha, Aalumagalu, Rechukka Pagati Chukka, Yetthuku Paiyetthu etc in the 50′s. She got to sing melodious “Andala oh chandama ravoyi” / “Mooge cheekati Musugulo” with PBS. Aswathama, T Chalapathi Rao, K V Mahadevan were the music directors who recognized the talent in young Janaki and gave her soulful melodies. Thus by the 60′s S Janaki was getting some melodious songs in Telugu but the song that brought her real talent out and made her’ The Melody Queen’ is’ Neeli Meghaalalo (Movie: Bava Maradallu), what a classic number and was composed by Pendyala again. And the song made her’ S.JANAKI’ is undoubtedly’ Nee Leela Paadeda Devaa’ (from’ Muripinche Muvvalu’ ) where she sings competing with a naadaswaram which made the listeners awestruck. Although she got comparatively less songs in her 60′s, but those she sang remain evergreen till date. Especially’ Pooja Phalam’ which had three golden hits, the most memorable being’ Pagale vennala’ (song inspired from’ aadha hain chandrama’) with great lyrics by Dr C Narayana Reddy with immortal tune composed by Saluri Rajeswarara Rao. The wonderful picturisation with Jamuna playing the Piano and ANR appreciating her singing in silence adds more beauty to the song. Other songs were’ Siva Deeksha Paruralanu ra’ and’ Madana manaseyera’ (inspired from Balma Manena of Lataji ). Narthanasala turned out to be a big musical hit with melodies of Great Ghantasala, Balamuralikrishna, Suseela. Janaki has her own share of success with her dance number remebered till date “Naravara O Kuruvara”. Music was by Susarla Dakhsniamoorthy. The Movie’ Sree Kakulandhra Mahavishnuvu Kadha’ has a beautiful melody’ Vallabha Priya Vallabha’ which is inspired from Lataji-C Ramachander classic’ Oh Nirdayi Preetham’. This movie had S Janaki all the way pairing with Ghantasala and Balamurali in the music of Pendyala. ‘Panthalu Pattimpulu’ is another melodious album where Janaki had beautiful duets with Suseela and L R Eshwari. ‘Oho Oho pavurama’ in’ Manchi Manasulu’ needs a special mention as the song has S Janaki singing for Sowcar Janaki ! Music of K V Mahadevan and awesome lyrics and wonderful picturistaion again. SP Kodandpani, Rajan Nagendra gave very good songs in their movies like Aggi pidugu, Gopaludu bhoopaludu to her. She worked with all music directors of the age like Ghantasala (O vannekada), Pendyala (Kusalama), S Rajeswara Rao (Pagalaithe Doravera), Rajan Nagendra (Poovulu Pooyunu Padivelu), M S Viswanathan (Ghal Ghal Ani Mogali), Aswathama (Entha Madhura seema), Master Venu ( Mroguna ee veena), K V Mahadevan (Oho Oho Pavurama), T Chalapathi Rao (Sarananna Vaarini Karuninche), S Hanumantha Rao(O veena cheli) etc…. The word “Melody” itself finds its meaning when compared to duets with Ghantasala, PB Sreenivas, Madhavapeddi Sathyam and Pithapuram Nageswara Rao. The list continues with so many hits. The Last song in their combination was from’ Deeksha’ of the 70s. The coincidence as Janaki always remembers in her interviews is that her first and last duet with Ghantasala had Pendyala’s tune. S Janaki and PB Sreenivas was a successful combination in Kannada and Tamil. They had some memorable duets in Telugu as well. The first melody by this pair that was widely appreciated was “Andaala O chandama ravoyi” which was equally popular in Tamil. Mooge cheekati musugulo had PBS SJ singing for NTR and Savithri to the tunes of Aswathama. Aa devudichina pathivi neeve – Devudichhina Bhartha. She sang some memorable duets with Suseela, Leela, Jikki, LR Eswari, Madhavapeddi Sathyam, Pithapuram Nageswararao during this period. Her Journey of wonderful duets with SP Balasubrahmanyam also started in the 60s in the music direction of SP Kodandapani, Sathyam and others. She gave a beautiful duet’ Konguna Kattesukona’ with young Yesudas. By 70′s Janaki and Suseela became two eyes of the Telugu film music. They were the main choice of all music directors. The 70′s was mainly dominated by Chakravarthy, KV Mahedvan, Sathyam, Ramesh Naidu etc.. It was the decade where Ilayaraja arrived with a big bang and S Janaki was unanimously the only choice for almost all the gems of notes which Raja ever wrote and undoubtedly every song striked the minds of the listener with ease. No doubt it will be an impression for the furture decades to come. And the 70′s saw some of the best songs of her career. In1971 a wonderful movie /musical ‘Bangaru Panjaram’ was released, and Janaki got to sing all songs for Vanisree. Soulful music by S RajeswaraRao/B Gopalam, soothing lyrics by Devulapalli Krishna sastry, innocent singing of Janaki made the album immortal. Starting from folky’ Gattu kada Evaro’,’ Kondala Konala Sooreedu’ to classy’ Pagalaithe Doravera’ to soulful’ Katha Chebutha’ and devotional’ SreeSaila mandira’ with Ghantasala, she excelled in every song of the album. ‘Sri Krisha Sathya’ (music by Pendyala) was another movie with S Janaki all the way. Every song was popular in this movie. Duets with Ghantasla and her solos like “Kalaganti”, “Maata meeruna” were classics. Music director Sathyam started flooding the opportunities to S Janaki. Some of his movies had only Janaki as female lead singer.’ Gunnamamidi Komma meeda’ needs a sepacial mention. This song penned by lyrical genius Dr C Narayana Reddy turned out to be a super hit. Especially the sad version is a tough game for any singer. It has the additional beauty of flute by Pandit Hariprasad Chourasia. Though she sang almost all songs of’ Balamithrula Kadha’, this song won admiration of all. ‘Kannevayasu’ was another beautiful album in this combination. The song that set the path for SPB’s music career “Ye Divilo Virisna” was sung equally great by Janaki. Her breath control and the high pitch in this song are simply great.’ Bullema Bullodu’ has another all time favourite haunting melody “Raja Pilupu Nadenura” which can be rated as one of the best haunting melodies ever released in telugu. ‘Karthika Deepam’ was the best of this combination. It had four songs by Janaki. A qawali styled solo, two wonderful duest with Balu and one memorable duet with Suseela’ Aaraneekuma ii Deepam’ with beautiful lyrics by Devulapalli. All time classic’ Nee Kowgililo’ has a small but interesting story behind its beauty. It was the first time when Janaki’s husband was admitted in hospital, suffering a heart attack. Janaki had to sing the song under compulsion of producers and the wording “Nee chethulalo kanu moosi” (let me die in your arms), made her emotional and her heartfelt rendering made the song a timeless classic. ‘Abhinava Sahirekhavo’ with SPB, Jilibili sogasari pilisthe (NOmu), Jabili vennalu (Angadi bomma), Ye thodu ledu evvaeru leru (anuragalu) etc. were from the same combination. T Chalapthirao gave hits like’ Sri Rama Raksha’ while Hanumantharao gave songs in’ Manushullo Devudu’,’ Aradhana’ etc.. When’ Geet’ movie was remade in Telugu as’ Aradhana’, she became the first choice for female vocal. She got the rare honor of singing with her most favorite singer Mohd Rafi. (She sang with him earlier in’ Thalla Pellama’).’ Naa madi ninnu pilinchi ganamai’ is an all time hit, while’ Nede thelisindi’ is a classic. The lines..’ Maaru moola palle lona madhura gaanamudayinchenani’ (a sweet singer is born in a small village) she sang for herself because in Pallapatla (a small town in AP) was where the Melody Queen Janaki took birth. The solo’ Neekela intha niraasa’ is such a gem of composition with beauty of words in SJ’ s melodious singing. She got to sing so many beautiful songs for KVMahadevan, Chakravarthy etc.. Mainly Chakravarthy gave her some interesting numbers. Best of their combination is undoubtedly’ Padaheralla vayasu’ where except’ Sirimalle poova’ (the original being Ilayaraja’s) all other songs were his own tunes and he even made a different beautiful tune for’ Sirimalle Poova’ but the producers insisted on using the original tamil score by Ilayaraja which became the biggest break for both SJ and Sridevi. (Prior to these were some tough songs like’ Sirimalle Poovalle navvu’ with SPB, ‘Gudilona Naa Swamy’ with LREswari). This movie set path for SJ – Chakravarthy combination which resulted in a variety of songs in 80′s. Ramesh Naidu made some memorable hits in 60′s like’ Manorama’. But his come back in the 70′s with movie’ Amma maata’ is trend setting. She sang’ Saddumanaga neeyavoi chanduruda’ in that movie. As usual SJ excells in expression (point to be noted: without disturbing the melody) and the movie’ Chillaru Kottu Chittema’ got two superb melodies,’ Suvvi Kasthuri Ranga’ and’ Em Cheppedi’.’ Radhamma pelli’ is the movie in which Sarada played three roles. Soulful’ Adadhi Korukune Varalu Rende Rendu’ (it has two versions – happy and pathos) has the humming in the beginning of the song which adds beauty to classic. Other song in movie is’ Paare Godavarila’ has beautiful lyrics.’ Chandana’ had four solos of Janaki,’ Ponnapoola ooyala’ is a big hit while’ Ee reyi sathakoti deepalu velagali’ is a classic. Ramesh Naidu gave her the most sensous melody number “letha letha yennello” in Kalyani. Actually the 80′s had the best of Ramesh Naidu and S Janaki combo songs. Her combination with MS Viswanathan was very good with songs like’ Kallao unnadedo’,’ Galikadupu ledu’ etc. becoming huge hits. Especially’ Kallalo Unnadedo’ is such a gem with beauty of lyrics like..” jarige nade jaruguni anni jarigina naade theliyunu konni” by great Athreya. Actually this song also has tamil original sung by Janaki herself and the same song is sung by her in malayalam also. Also’ Galikadupu ledu’ is a very tough composition rendered in a very easy manner by her and she sang beautiful songs like’ Andamaina loka mani rangu rangu luntayanai’ which again has beautiful lyrics. S Janaki was the favourite singer of G.K.Venkatesh. He involved S Janki in most of his best compositions in Kannada. He composed for very few movies in telugu, but made sure that Janaki was a part of his albums always. Sridevi (Rasanu premalkehalenno, Brathuke vedanaga), Sannayi Appana (Kariginchu ii kaliki hrudayam), America Ammayi (Tell me Tell Me) are some of the memorable telugu albums. Ilayaraja was assistant music director in GKV’s team, and he got an opportunity to work with Janaki for variety of songs under GKV. He played a vital role in the composition of ‘ Rasanu Premalekhalenno’ (mainly humming part in it) and’ Ravi varmake andani oke oka andanivo’. When he became an independent music director for Tamil film’ Annakili’ the first thing he wanted was S Janaki to sing for his movie. Thus started the Janaki -Ilayaraja magical combintaion. She practically sang 80% of his best female solos/duets. He made sure that she sings the tune in one of the languages where he used the tune and some of the songs he made sure she sings in all languages where it is made. He made her sing his tunes in Tamil, Telugu, Kannada, Malayalam and Hindi !!! Everywhere they saw nothing but success. In Telugu the 70′s saw some of the dubbed movies and very few direct movies of Ilayaraja. The 80′s under this combination was a musical treat for Telugu listeners. The 70′s set the path for the best pair in duets, SJ and SPB, with beauties like Malle poovulu pilla navvulu, Nee klowgili lo thala daachi, Veena venuvaina sarigama etc. S.Rajeswara Rao, Sathyam, Chakravarthy, KVM, MSV, GKV, Ramesh Naidu, Ilayaraja, Rajan/Nagendra etc had some of their best compositions sung by this pair. SPB is most versatile in bringing out the expression and feel of the song. SJ excelled in matching him and SPB excelled in being the best pair with SJ through out in Telugu, Tamil and Kannada. KJ Yesudas shared melodies with her in Malayalam. SJ SPB is one of the best duet pairs South Indian film music had ever seen. They erased the boundaries of imagintion of music directors and particularly their combination with Ilayaraja is nothing but magic and pure melody. Yadhalo tholi valape – Erra gulabhilu. P Suseela,S Janaki – The two faces of a coin. We cannot imagine Telugu music without the contributions by these two legends. They have sung excellent solos, duets and gave great time to us. If one is melody queen, the other is versatile genius. We are blessed to have them among us. It was a previlege to music directors to use their combination. Some of memorable duets of this pair from the 60′s,70′s, 80′s. And the Journey Continues……..Stay Tuned for her career highlights from 80′s till date…..